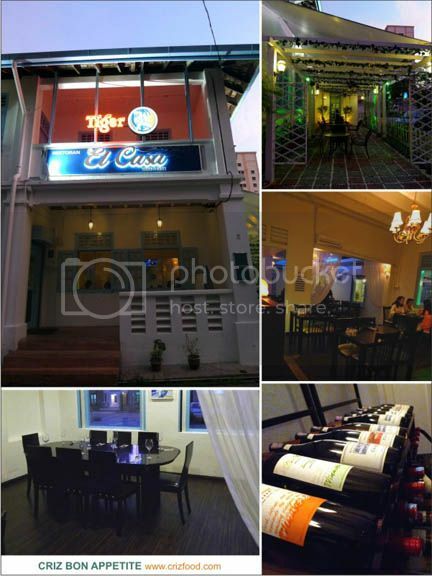 Many outsiders might not notice that within the suburbs of the Georgetown is a little cozy restaurant by the name of El Casa Wine & Dine Restaurant, which serves freshly home cooked pork-free dishes without the usage of monosodium glutamate (MSG). The name itself is self explanatory as this is a place to dine with wine or simply to chill out with partner or friends over a few glasses of wine. A corner lot along the colonial days’ row of residential houses, this restaurant promised a dimly blue lighted ambience with some impressive mini chandelier-like ceiling lamps and a romantic outdoor dining area for those who love dining under the glittering of the stars during dinner time (but do mind those pesky night blood suckers, ok?). 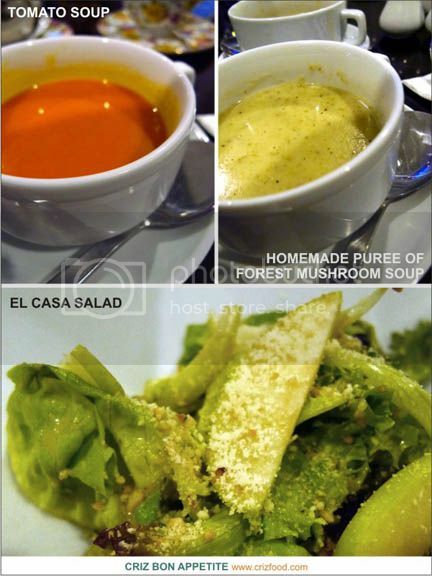 As for starter, there would always be the Daily Chef’s Homemade Special Western Cream Soup (RM6.90) or Homemade Puree of Forest Mushroom Soup (RM6.90), respectively served with a slice of garlic bread. The daily chef’s homemade soup can vary from tomato, cauliflower, watercress and carrot soups. The Soup of the Day happened to be Tomato Soup which had fresh tomatoes, celeries, onions and so on, all blended and cooked into a smooth paste, with a drizzle of black pepper. Not too bad for the taste but I would prefer to have some cream added on to give it an extra boost of creaminess and that impressive flowery presentation as you would have on your latte. The Homemade Puree of Forest Mushroom Soup on the other hand had the creaminess from some sautéed potatoes blended in with wild mushrooms with a touch of thymes, mixed herbs and olive oil. It was a great chance from those powdered one which you could easily get from those street western food stalls. There was also the El Casa Salad (RM11.90) which in my opinion was rather a small portion to justify against the price. It came with just a few leaves of red leaf lettuce, green apple slices and topped with their homemade honey mustard dressing and some bread crumbs. Although the taste was acceptable, it lacked those crunchy bites from the croutons which they were to have as in their menu description. Moreover, they omitted the sundried tomatoes, which were not suitable for our consumption on that night without any replacements. They could have used some fresh tomatoes or even substitute with raisins or finely sliced carrots to boost up the bulk and colors. What happened to the creativity of the chef? 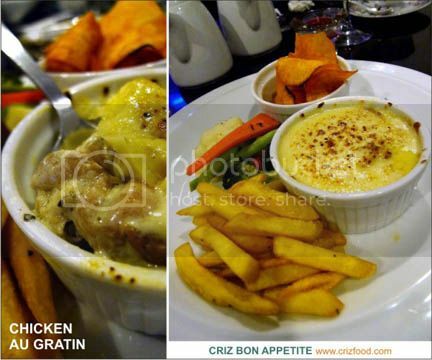 Their first signature dish that filled the room with cheesy aroma was their Homemade Chicken Au Gratin (RM17.90). It had layers of creamy cheese made out of a combination of mozzarella and parmesan cheeses, topped on some mushroom slices plus chicken drumstick cuts and baked to golden perfection. It comes together with some sautéed garden vegetables, fries and a bowl of spicy tapioca chips. It’s rich in flavors and would surely fit any ages of diners. 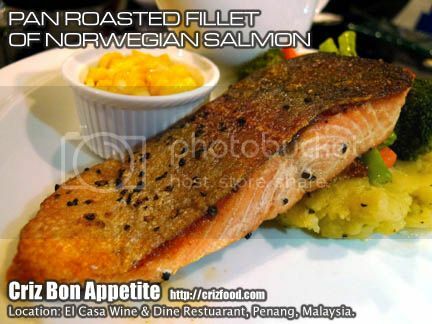 The next dish was their signature Pan Roasted Fillet of Norwegian Salmon (RM27.90) which came with a mixed herb lemon butter sauce and served with mixed herb mashed potato and sautéed garden vegetables plus a bowl of freshly cooked buttered corn kernels. The fillet was well marinated exteriorly but with a bit too much of salt applied. Luckily, the interior part still maintained that moist to justify the whole combination. It blended in quite well with the butter lemon sauce which had a strong citrus sourness. I personally felt that a more buttery and salty brand of butter (such as Butter Cup) with just a light twist of lemon juice would taste better. At least they can just pan roast the salmon without much marinates to maintain its original taste. Their mashed potatoes side dish was lovely. 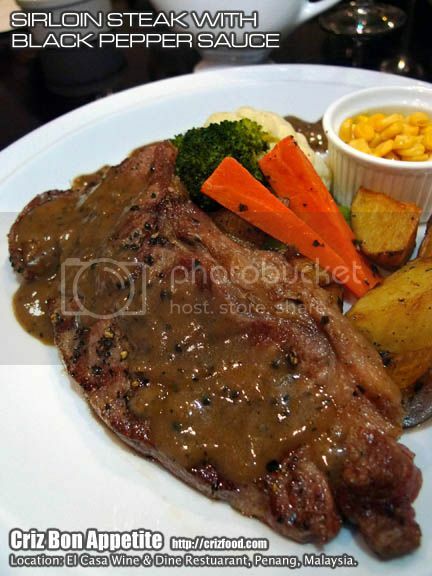 For steak lovers, the next dish which was the Sirloin Steak (180 gm – RM28.90) served with some sautéed garden vegetables, potato wedges, and a bowl of freshly cooked buttered corn kernel, topped with black pepper sauce would be the ideal choice for your visit. The medium-rare slab of well marinated grilled beef with some sprinkles of black peppers was just right in taste even without the accompanied black pepper sauce. The only hiccup was the fatty parts which was a bit too tough to my liking. Overall, it was a great dish. 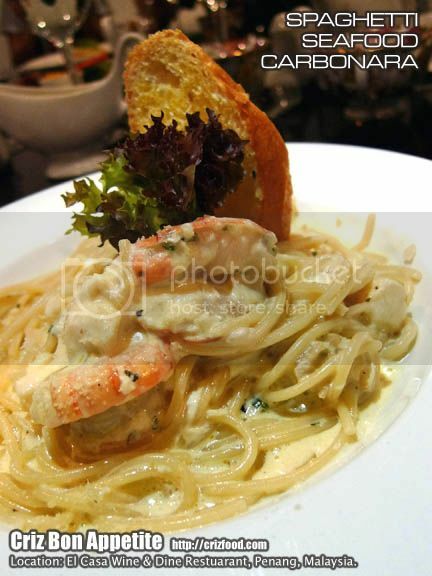 In between those meaty dishes, we had the Spaghetti Seafood Carbonara (RM18.90), which had pieces of tilapia fillet, squids and prawns cooked in their special creamy white sauce and garnished some grated parmesan cheese and served with a baguette toast. Taste wise, it was not bad but I would prefer my sauce to be a bit creamier or thicker, not drowned in so much sauce and with more sprinkles of mixed herbs. The spaghetti had the required al dente for each bite. 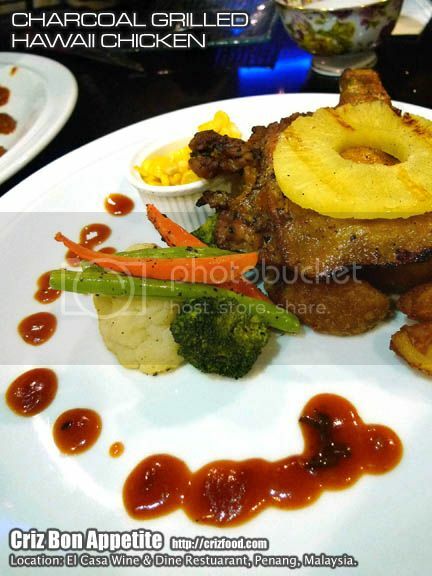 Next was the Charcoal Grilled Hawaii Chicken (RM13.90) which was served with their homemade tropical barbeque sauce, accompanied by some fries, sautéed garden vegetable, slightly grilled sweetened pineapple and a bowl of freshly cooked buttered corn kernels. This was just a normal tasting grilled chicken with the basic marinates. It lacked some hammer pounding to tenderize the meat through the grilling process, thus certain parts with veins could be rather hard to consume. The tropical barbeque sauce was quite unique with some citrus sweetness. The last of the main courses was the Pan Roasted Seabass Fillet with Arrabbiata Sauce (RM19.90), served with some sautéed garden vegetables, potato wedges, and a bowl of freshly cooked buttered corn kernel, topped with Arrabbiata sauce. The sauce was somewhat spicy with some traces of tomatoes, garlic, chilies, herbs and olive oil. 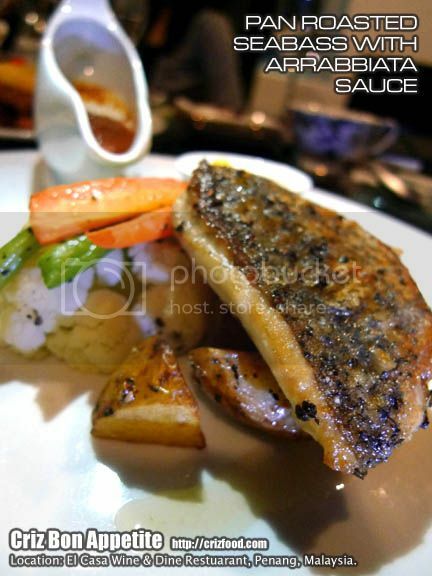 The texture and moist within the fillet was just nice to savor the fresh flavors from the fish. It was a unique concoction but somehow it killed the original taste of the fish with an overpowering sauce. A simple sauce of just chopped garlic and butter with a fresh twist of lemon juice would suit the dish more. Finally, it was time for some delicious Home Desserts (RM5.90). 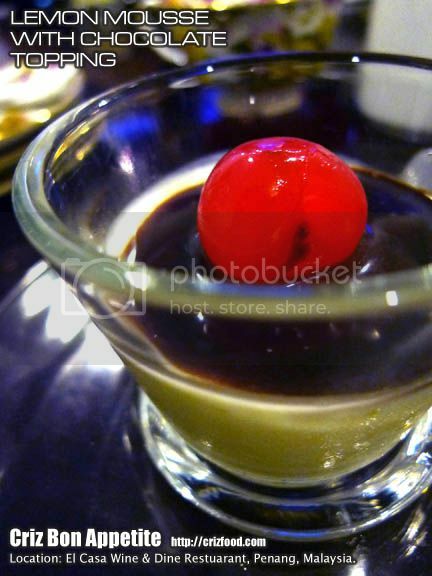 We had Lemon Mousse with Chocolate Topping for the night. Although this was a nice and light palate-cleansing dessert to end a meal after such heavy main courses, it somehow did not go well with the chocolate topping. It tasted rather weird for many. It would be better if the chef just keep the dessert simple with just a spray of whipped cream with some sprinkles of lemon zest. Alternatively, truffles, mixed fruit yoghurt or just a simple scoop of ice cream with some fresh fruit cubes would end a meal better. 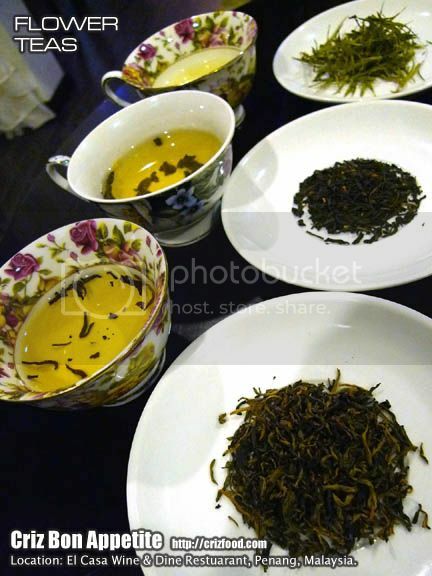 The best part of dining here other than sipping in wine and other beverages would be having some hot brewing flower teas in their fine China wares. They have a few options here such as the Organic Green (RM6.90) which would help in lowering the cholesterol and blood pressure, strengthening the immune system and fighting against aging, Pink Rose (RM6.90) which would help to regulate blood circulation, purifying, cleansing and detoxifying and to have a glowing and youthful appearances on the skin, Jasmine (RM5.90) which would help to cool the body, refresh mind, help catharsis, and to regulate aging and constipation, Red Tea (RM5.90 – sometimes also known as the Long Life Tea) which is an anti-oxidant-rich, caffeine free tea suitable for people with busy lifestyles and Chrysanthemum (RM5.90) which would help against cough, expectorant, anti-oxidation, enhance immunity, inhibition of blood cholesterol and high blood pressure. El Casa Wine & Dine Restaurant would not be visible by the main road. If you are from town towards Pulau Tikus along Jalan Burma, keep to your right after passing the Giant Supermarket (Penang Plaza) at the junction of Jalan Burma/Jalan Larut. Keep driving until you have passed Him Heang, a church, Jemputee (junction of Jalan Burma/Jalan Chow Thye), a vegetarian food court and Malaysian Chin Woo Association on your right. Turn right into Jalan Servis (between Chin Woo Association and Malaysian Buddhists’ Association) and drive all the way in until your see a right junction (Jalan Irrawadi). 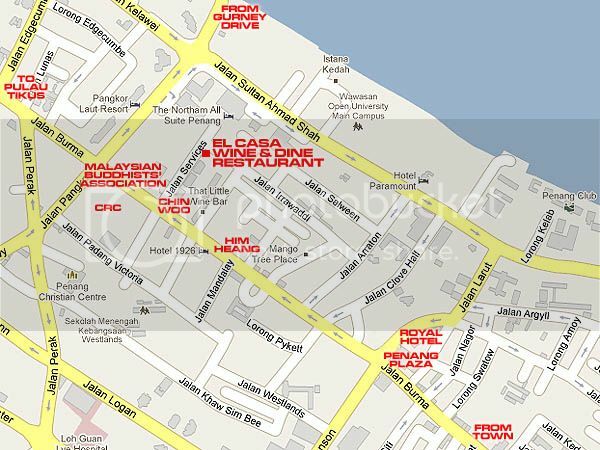 The restaurant is at the corner lot of Jalan Servis/Jalan Irrawadi. It would be easier to find parking spaces here during dinner time after the working hours of the surrounding offices. Address: No. 2, Jalan Irrawaddi, 10500 Penang, Malaysia. WHERE TO EAT? NO EYE DEER! Disappointing article! A review of a wine house but there was no mention of its wine list? The right wine will bring out the true potential flavour of the food it is complementing. Thanks for your feed back Mr. Will Ong. Not all food writers are alcohol drinker and thus we will normally post the availability but not on the taste as we are not the experts in judging wine. You could always call in to ask about your choice of wine.